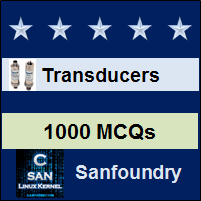 This set of Instrumentation Transducers Multiple Choice Questions & Answers (MCQs) focuses on “Telemetry Systems”. 1. Which of the following represents telemetry? Explanation: Telemetry is the process of accessing or collecting data from remote inaccessible points. Explanation: Telemetry is the process of data transmission which may include over any known modes. 3. Which of the following represents a telemeter? Explanation: Telemeter is the device used for the purpose of telemetry, and it may be analog or digital in nature. 4. Which of the following mode of signals cannot be transmitted using telemetry? Explanation: All kind of information can be transferred using the telemetry system. Explanation: Before transmission, data is converted into electrical signals and then transmitted. Explanation: Telemetry allows data flow only in a single direction, that is from source to receiver. 7. Telemetry systems are of electrical type only. Explanation: Telemetry system may be of electrical, pneumatic or any other systems. 8. Which of the following is not true for telemeter? Explanation: Telemeters are designed for specific to certain variables. Explanation: Multiplexing is the process of use of a single data link for transferring multiple data. 10. Telemechanics and telemetry are related. Explanation: Tele mechanics deals with operations as desired for remote control and telemetry.